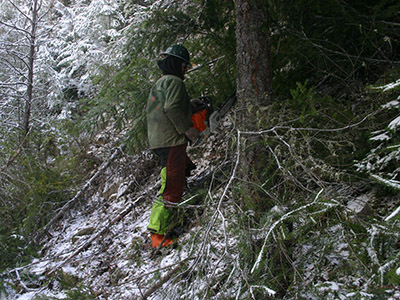 Who is the NW forestry workforce? The iconic Northwest image of a lumberjack swinging his axe amid towering conifers has not reflected reality for over a century. Technology has made mechanized logging the norm, except on the steepest slopes, such as many in the Northwest. And the workforce today does not reflect the logging workforce even a generation ago. Experienced loggers are aging and the new workforce has a high turnover rate. A reliable Hispanic workforce is becoming more common in both forest restoration and logging, presenting new challenges with communications (critical to safety) and subcontractor management. As the workforce changes, safety and health efforts must change with it or workers will pay the price in injuries or their lives. Logging fatality rates exceed the national average by 30 times. Forestry workers are 30 times more likely to die on the job. Research rates logging among the most exertive work. Injury and death rates in logging and related industries have often been cyclical. For example, injuries among Oregon loggers increased 77% after the 1980-1981 recession as companies quickly rebuilt their workforces. Data in Oregon, Washington, and Idaho show that loggers who are least 45 years old represent around 50% of the workforce, a percentage that is growing. Other states and countries show similar trends. Latino immigrant workers are increasingly finding employment as laborers in Pacific Northwest forests in logging and represent the majority of forest service workers. Forest services (management, nurseries, and specialty forest product harvesting, among others) are an expanding industry, growing with the need to more actively mange our forests, such as to reduce fuel loads to prevent forest fire. 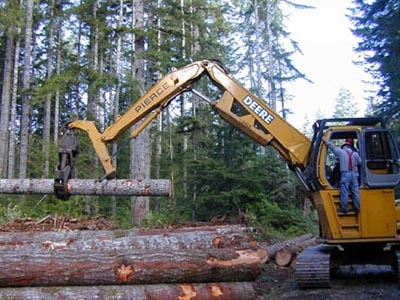 The forestry services industry also has a high rate of injuries and illness. From 2003 to 2008, there was an average of 8.86 injuries and illnesses per 100 workers in Oregon compared to an average of 5.3 per 100 workers for all of private industry. Common injuries include broken bones, open wounds, severe poison oak rashes, and dehydration. Although not as high as the fatality rate for loggers, the fatality rate among forest workers is higher than the rate for all industries. The Northwest Forest Worker Safety Review is a newsletter shares regional news of research, developments, and upcoming events. Issues are compiled annually by the Pacific Northwest Agricultural Safety and Health Center.